Individualized instruction is one of those buzzwords thrown around all the time – especially by firms that market educational software. They sound great, but what’s really “behind the curtain?” Or better yet, is there anything at all behind the curtain? Providing individualized instruction is a worthy goal, but the term is so broad, it can mean almost anything to anyone. There’s little or no agreement about what the words mean, much less how to go about achieving it. It seems to be that one way to improve the situation is to start by defining the basis for individualizing instruction. More simply, the issue can be reduced to two main issues: “what” gets individualized, and “how” is it individualized. On these issues there is little clarity, and it’s made more difficult because they’re closely intertwined. First let’s look at what gets individualized. Many people argue that the basis for individualizing instruction comes from the belief that every person has a different learning style. 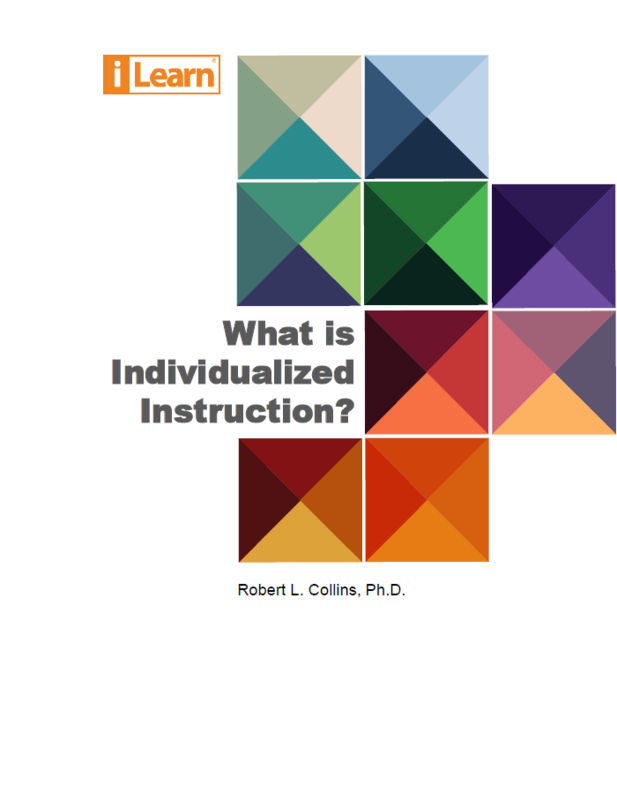 Because of that, the way to individualize, according to this view, is to try to match the “way” instruction is delivered to the learning style of each individual. But there’s a completely different approach that is thoroughly grounded in research. It’s research on what is generally described as “explicit, systematic” instruction. This approach has been shown to be effective in improving learning outcomes, especially for students who have difficulty in learning a particular subject - in this case, math. This body of research is far too broad to even summarize here, but it leads to some important implications about what should be individualized. An excellent review can be found in Gersten, et. al. (2009a). That means, when learning topics at grade level, these students are hampered by a lack of mastery of the concepts and skills that are required to understand and master those grade-level topics. This is a major factor in why they struggle to learn the new content. For example, it has been widely documented that a very high percentage of “at risk” students have very little mastery of topics related to fractions (NMAP, 2008). As they progress from fourth grade through high school algebra, this becomes a major stumbling block to success at those grade levels. In our work, we have documented in detail an enormous number of gaps such as these for students who are seen as “at risk” of failure in math. The number of these gaps (that include far more than just fractions) is even more extreme than commonly recognized. They vary across students in three important ways. The first is the “depth” of the gaps, which is how many grade levels below the students’ current grade level these gaps exist. The second is the “density” of gaps, which is the number of gaps at each succeeding grade level. Finally, the third is the “diversity” of the gaps across students – the fact that every student has a different set of gaps. The existence of these three conditions contains a clear message. Instruction to address these gaps must be as individualized as possible to meet these widely varying gaps in each student’s knowledge. But the question remains – what do you individualize and how do you do it? The answer to the first part of the question is virtually mandated by the nature of the problem. Every student must receive exactly the specific instruction needed to address each gap (and only that instruction to avoid unnecessary work). This is individualizing the curriculum, which is the “content” of the lessons taught. Addressing any such “pre-requisite” knowledge for any topic (prior to starting more advanced instruction on that topic) is actually one of the foundational principles of mastery learning as applied to MTSS (e.g., see Mastery Learning 2.0). It’s important that students master all relevant pre-requisite topics, and in the proper order, before later content can be mastered. For example, it is beneficial for students to master the basic math facts before they start learning to do multi-digit operations that are based on those facts (along with an understanding of place value). This issue is recognized as an important one in MTSS. One of its basic principles is the use of more “intensive” intervention or support as the situation calls for. The reason for smaller groups is that it allows the teacher to more precisely determine each student’s needs and provide support that is more tailored specifically to those needs. While there is little focus on why small groups are used, and more on the size of the group. And finally, the reality is, students do vary in other ways besides the content they need to learn to succeed. This leads us to the other consideration of how to individualize. The short answer – practice and review. Unfortunately, this is simple to say, but it’s not easy to do. One of the most important sources of the difference in students has been found to be the amount of practice and review it takes to attain mastery, and retain mastery, of new content. One of the widely accepted findings in the relevant research is that students who struggle when learning reading may need from 10 to 30 times as much practice as other students (Gersten,et. al, 2009b) and it is also the case for math as well. This of course, implies wide differences among this group of students themselves. Some may need 10 times as much, some 20 times as much, some 30 times as much, and so on. This is a very important dimension on which instruction for each student should be individualized. There is a second issue that is also important in customizing practice and review. It’s another important feature of “explicit, systematic” instruction. Unfortunately, the label for this feature is frequently misused. This has become one of those buzzwords that almost everyone uses, but when you look at how it’s used, it’s widely different – and usually incorrect. But scaffolding is an important reason for the need to individualize instruction. So what is scaffolding really? The definition we’ll use comes from the extensive research on explicit, systematic instruction which is reviewed in Gersten (2009a). In simplistic terms, it’s a technique for facilitating the transfer of knowledge from the teacher to the student in an efficient manner. It’s embedded in the process for answering questions or solving problems, when the teacher gradually requires the student to take over more responsibility for answering on their own. The really important feature of scaffolding is one that almost never gets mentioned. It’s associated with the word “transfer,” and it’s the main reason scaffolding should be individualized. At the beginning of instruction, the teacher provides new information to the student. Learning occurs when the student “acquires” that information. To find out whether and when the student has “acquired” the new information, the teacher poses questions or problems. The answers to these let the teacher know whether the student understands a concept or has mastered the ability to solve problems of a certain type. This transition is critical, and it doesn’t occur at the same rate for all students. The purpose of scaffolding is to this transition, easier, more reliable, and more accurate than would otherwise occur. When done properly, students are more successful because the scaffolding facilitates learning with fewer errors. One way to think about scaffolding is in terms of the old saying “I do, we do, you do” as a way to describe the process. The end goal, of course, is the “you do” part where the student responds independently, without scaffolding. That’s why scaffolding is a “transition” process. The transition has three stages: 1) the teacher provides the new information which the student attends to, 2) the teacher provides the student an opportunity to show they understood by posing questions or problems that the student has a very high probability of answering correctly, and 3) at the appropriate time, the teacher gradually withdraws the support provided by the scaffolding and the student must answer the questions and problems on the same topic without any assistance. This is a very complex process, but highly effective when done properly. One reason it’s complex is that the specific embodiment of the process is different for every topic, which is another reason why scaffolding should be individualized by topic. The goal for each topic is to provide enough support to facilitate a rapid transition to independent answering by the student, but not so rapid that students start making a lot of errors. As noted above, the use of the term “scaffolding” is often misused, to the point of abuse. For example, it is not uncommon to hear that “scaffolded” instruction is provided simply because the program provides feedback with “error correction”. Suffice it to say, however, that is not what scaffolding means, as defined in the research literature. So, in summary, the critical variables in delivering practice and review are determining and delivering the right amount of practice and review to meet the individual needs of each student and managing the delivery of this process to ensure a successful transition to independent success with a minimum of errors and frustration. When this is done well, the need for “corrective feedback” diminishes. The best way to individualize instruction is to give every student exactly what they need to learn, make it as easy as possible to learn it, and make sure each student receives enough practice and review so they retain what they’ve learned. All of this is to be done while focusing on preventing errors rather than trying to correct them. Gersten, R., Beckmann, S., Clarke, B., Foegen, A., Marsh, L., Star, J.R., Witzel, B. (2009a). Assisting Students Struggling with Mathematics: Response to Intervention (RtI) for Elementary and Middle Schools. Gersten, R., Compton, D., Connor, C.M., Dimino, J., Santoro, L., Linan-Thompson, S., Tilly, D. (2009b) Assisting Students Struggling with Reading: Response to Intervention and Multi-Tier Intervention in the Primary Grades.